But state requirements may be pushing county’s smaller child care centers out of business. Hermione Riggins is one of 81 children who attends the Burke Early Education Center. Photo by Analise Pruni/NNS. While YoungStar ratings for child care centers are improving in Milwaukee County, the number of family providers continues to fall. The number of children enrolled in high-quality child care (rated four or five stars) more than tripled in Milwaukee County between 2013 and 2018, increasing from 1,693 to 6,077, according to a recent report by the Wisconsin Policy Forum. However, 85 percent of certified family childcare providers in Milwaukee County have closed in the last 10 years, according to the Quality Early Care & Education Network, a project of Milwaukee Succeeds. There are now 549 certified or licensed family providers with two or more stars in Milwaukee County, according to the “child care finder” on the Wisconsin Department of Children and Families YoungStar website. 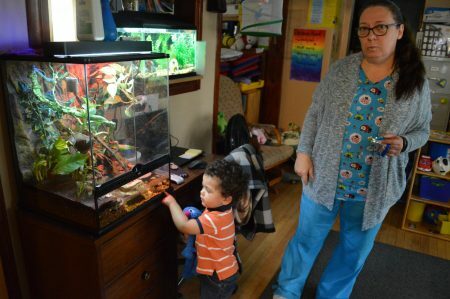 Joseph Carey loves watching the lizards when he stays at Mama Bear’s Family Child Care, owned by Barbara Kelley. Photo by Analise Pruni/NNS. YoungStar evaluates Wisconsin child care centers on a scale of one to five, based on staff education; learning environment and curriculum; business and professional practices; and health and wellness practices. Childcare providers that receive state funding are required to participate in YoungStar. Mama Bear’s Family Child Care, at 2311 E. Vollmer Ave., is an example of a high-quality family provider that is struggling to keep the doors open. Although the center’s YoungStar rating rose from three to four stars in the most recent evaluation, the improvement came at a price. Kelley has an associate’s degree in early childhood education. She has raised five kids of her own, has six grandchildren and started babysitting when she was 13 years old. Despite her years in the field, she plans to close Mama Bear’s as soon as she can afford to. She said she wants to pursue a business degree. 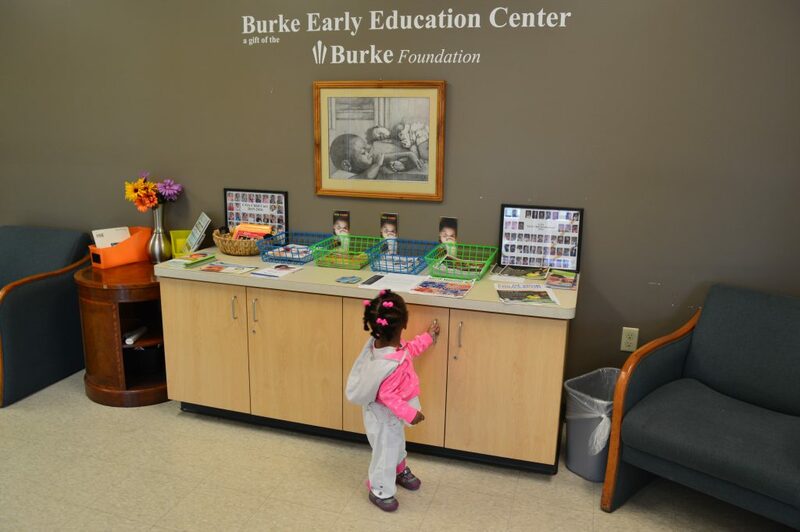 The Burke Early Education Center, located at the COA Goldin Center at 2320 W. Burleigh St. in Amani, started with a two-star rating and now has four stars. In addition to evaluating child care quality, YoungStar directs providers toward grants and offers them technical assistance to help improve their ratings. Some of the assistance is specifically aimed at improving two- and three-star providers. DCF offers free college courses, technical consulting and on-site training. It also distributed 1,200 kits containing books, art and play materials, and math and fine motor-skills supplies to two- and three-star centers. The Burke center, which can enroll up to 116 children, shares best practices with other providers to help them succeed. “We can be a pilot for other programs,” said Ashley Harrell, the center’s director. Group centers such as Burke tend to rate better and have more resources than family providers, according to the WPF report. Most providers in the state have a two-star rating, the report found. Insufficient education is a key barrier to improving YoungStar ratings. Family providers often lack the funds and the time to go back to school. There are also fewer opportunities to advance professionally at in-home family operations compared to larger group centers. “Education is definitely a barrier, but also what we’re giving early education teachers is almost an insult,” Harrell said. “We don’t really treat daycare or early education center teachers as teachers.” The average childcare teacher makes $8.50, according to the Quality Early Care & Education Network. Four- and five-star providers receive a boost in payments from the state, while three-star providers receive the baseline payment. Child care operations with two stars have been penalized 5 percent in their state funding. However, beginning this month the reduction will only be 1 percent. According to the WPF report, the DCF has begun to address some of the factors that prevent family providers from improving their ratings. DCF has said that the education requirements to qualify for three stars would change in 2019-2020, stating that the changes will “reduce cost and other structural barriers to higher education completion and support family child care programs.” In lieu of completing college coursework, two-star providers will be able to demonstrate strong knowledge of high-quality program practices to achieve the three-star rating. Although some family providers find it difficult to keep up with YoungStar regulations, the number of quality providers in general is on the rise. Between February 2013 and July 2018, four- and five-star child care providers in Milwaukee County increased from 60 to 152, according to the WPF report.